You are currently browsing articles tagged Martin Bell. 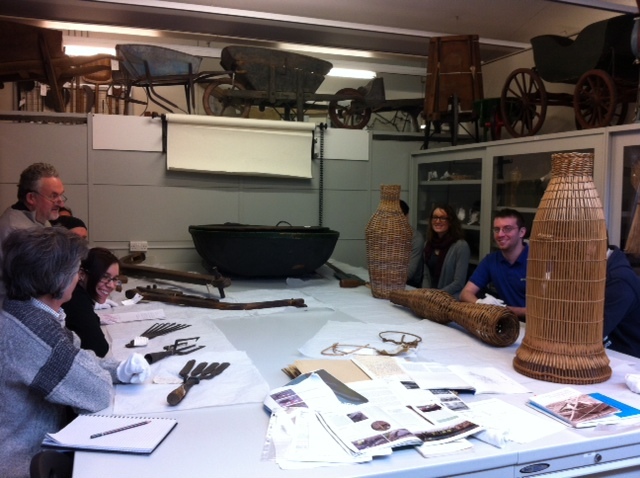 Today’s teaching session in the MERL stores. We had a visit this morning, led by Prof. Martin Bell, from some Coastal and Maritime Archaeology students who had come to look at a selection of fishing-related objects. We got out a selection of basketwork eel traps of different shapes (63/171, 63/173, 63/606), some simple willow ties (63/75, 64/152), a selection of eel and fish spears of different designs (51/7, 51/1198, 53/258), a Welsh coracle with paddle and club (56/187/1, 56/187/2. 60/641), and a replica ard (a rudimentary plough) (63/610). The students also looked at some salmon traps (64/22, 64/23) in the gallery. You can find out more about these objects by searching the online catalogue. It was really good to see MERL’s collections being used as a teaching resource – it would be great to have more of these visits! I hope everyone found it as interesting as I did – I really enjoyed listening and finding out about comparable objects found in the archaeological record. It’s visits like these which highlight the different ways which museum collections can be used, and which help us to understand and interpret our collections in new ways. And it makes for a good break from cataloguing!